I have been working all week getting ready for convention as well as holding classes. Busy, busy time. I am looking forward to seeing all my girlfriends! Today I start picking them up. This year I am so lucky that convention is in Denver. No flying for me. I can just pick everyone up! I will have 4 girlfriends staying with me until Wednesday and then we head up to Denver. I am so excited about this years convention. I am almost finished with my swaps! I am usually last minute nelly when it comes to my swaps and this year is nothing different. I still have about 50 card fronts to put together. I can't wait to show you everything I have done. In the meantime, I thought I would show you a little frame I made for a girlfriend that is getting ready to move. :( Remember back when I first moved here and I only had ONE friend? Well, she is moving. I am so sad to see her leave. I believe God puts people in your life for a reason! She is a military wife, and off to their next duty station! FLORIDA of course. We can only laugh how the tables are turned. At least I will know another great person in Florida. Well, today really starts all the excitement of the next week. I can't wait to get to the convention center!!! It will be a BLAST! Hope you find time this week to get a little stampin' in! Until next week! 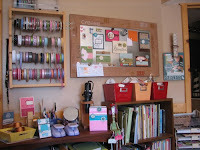 Yesterday I taught a fun scrapbook class on designing layouts! 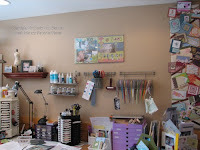 It is a series of classes that will occur monthly and teaches the basics of scrapbooking. Here are a few of the layouts I taught yesterday! If you are local and would like to attend next month, just email me. Next month we will learn how to use Patterned Paper! Should be another very fun class! WOW! I have been stampin' so much that you can smell the rubber burnin'! I had quite a few classes this week and I thought I would share a sample with you. I had a Chipboard class the other night that was a blast. I love all the things you can do with chipboard. We made 3 cards and a key ring. 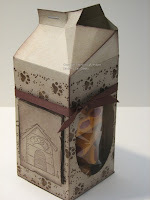 This card I tried to show how you can layer the chipboard and add depth to the card. We stamped and inked the chipboard. We used the paisley background on top of the larger flower and it was so pretty. I love how the rhinestones just catch your eye! Very pretty!! I've also been working on more class projects as well swaps for convention. I am so excited to see my many friends that are coming. It will be a great reunion. Only a week away and they will start coming in. Time for me to hit the hay and dream about my stamps!! It appears I was tagged! I think twice. Please excuse me for being outta the loopage. 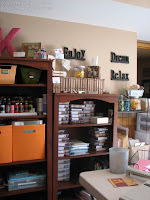 I have been quite busy in the stampin' room! Creating a bunch of stuff for upcoming classes and SWAPS! Alex tagged me last. 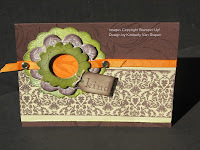 You can visit her blog California Stampin'! Just click on the link to the right. She is a super gal. Okay, so 7 Random things about me? Let me see if I can come up with that many. I might bore you! 1. 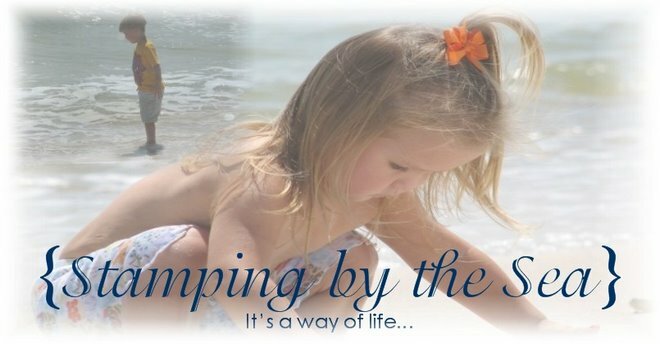 My blog name Stamping by the Sea was created by me because I have always lived by the SEA, until NOW! Now I live in the mountains. However, my heart is by the sea! 2. I could eat hot dogs all day. It is one of my favorite foods. 4. I watch three soap operas daily. If I don't get to see them during the day, I record them. 5. I am addicted to the weather channel! 6. I have a PEN fettish! If you leave one around me, I may steal it! 7. My husband still gives me butterflies in my belly! Our anniversary is Wednesday! We will celebrate 11 years. Whoo hoo!! I *think* I will have a few things to share tomorrow. I have been extra busy! Convention is around the corner and I am so excited to see my girlfriends. Nothing could be better than time away, and stampin' with your buddies. Yippie!!!!! Can't wait! Oh it is late! As usual I have been stampin' until the late hours. I have gotten a lot done and I feel GREAT! So you ask why do I need your help?? Actually, I need your RAK help! I have someone in my downline that I think could use a few cards in the mail! Great things are happening in her life! She just retired as a Navy Commander mid June and then a few weeks later she took her oldest son to the Naval Academy to be sworn in. We all know this is GREAT news, however think about it...Retirement, plus emptynest= a friend that needs a RAK! She is also getting ready to move across the country. 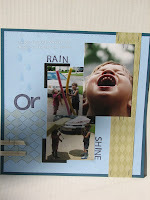 You can check out her new blog as I have it listed on the sidebar *California Stampin'*. If you are interested, please email me and I will give you her address. I know she would appreciate it. She is a GREAT stamper, great friend and just needs a big FAT hug-a-roo! I can't do it personally since we are many miles apart, but I CAN do it through the mail!!! This brings up a great thought once again. I have mentioned this so many times but I will mention it again! The greatest thing about my business is the wonderful friendships I have made along the way. So, I thought I would say a big hello to all my friends around! Sure do miss all of you! Hello RI, VA, FL and those of you that have scattered EVERYWHERE!!!! I can hardly keep up with my military girlfriends. I think I would have to list all 50 states! Of course I better not forget Sonya.... in SC! LOL! That silly southern girl!! Hugs!!! 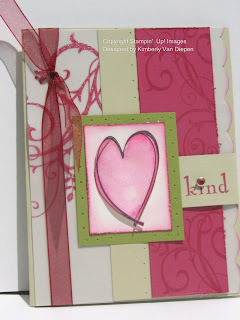 Isn't stamping/scrappin' GREAT? I never would of met these ladies had it not been for Stamping!! WOW!!!!! Dang, I did it again. Started babbling. THIS is why I only post projects in the morning. LOL! I think I will go to sleep and zip my lips! Much work needed tomorrow. Have a super duper weekend. I shall post a super duper card tomorrow!!! At least I think so! Well, I just have to share this with you! Keep in mind the stamp set that I used is so old, I don't even know the name of it. It is actually in my kids stamp pile. A sweet sweet friend of mine has my RUFF DAY set. *wink* Now, I have to have the new DOGGIE set. A must! This is not my original idea! 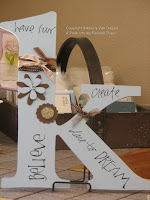 Inspiration comes from a demo named Marsha VanDever! As soon as I had heard about the idea I had to PLAY! So thank you Marsha! This was made using the milk carton template. After looking at the template, and three sheets of cardstock later... this is what I finally came up with. Here is the recipe! A peek into my ROOM! Oh, I am just so excited to share the CREATIVE palace with you finally!! Russ and I spent last weekend painting my room and then hanging all the fun stuff I have collected over the years! I must tell you I just love my husband. For a man to really put the time he has in this room, it says a lot. If you remember from the archives this room use to be Hunter Green. I didn't mind the color, but it was sooooo dark. Being in the basement, this room needed to be a little lighter and I have to keep it HAPPY! I love being in here. Oh oh oh oh!!!!! So here are a few pics for you to see! 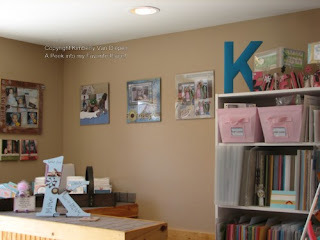 I got the "K" at Archivers and painted it with a Soft Sky paint. Then added our fun chipboard and some rub ons for a little fun. I have "K's" throughout my entire room. Funny the places I have found these monograms. My favorite place to find them are The Home Goods store. Oh, I just love that place. Anyways, I am busy creating. I will share later. It is a BUSY day to stamp! I hope you had a wonderful 4th of July! We took the kids to see the fireworks last night and they loved it. They were out as soon as we got in the car to come home! Thanks for taking a "peek"!!!! I thought I would share a card that has a few of the new stamps! I love this big heart and thought it would go so well with the Baroque Motifs set. I embossed on the v ellum using the pomegrante ink pad and then used the clear embossing powder over it. You can use classic pads to emboss on the vellum as it will not dry right away. Anyways, I really like how these colors turned out. What do you think? Do you have a color combo that you love with the new in colors? No stamping for me tonight. I just spent three hours organizing all my retired sets. All 195! Ahhhhhhhhhhhhhhhhhhhhhhhhhhhhhh! My cabinet is bare bones. So glad new stamps are on the way. I can't wait. I really love this new catalog!! !